Family members reunite through bars and mesh of the U.S.-Mexico border fence at Friendship Park on November 17, 2013 in San Diego, California. “The numbers are staggering,” said Pedro Rios, Director of American Friends Service Committee in San Diego. In the last year, U.S. Customs and Border Protection agents have seen a 92 percent increase in the number of unaccompanied children crossing into the United States. Some of those entering the U.S. alone are younger than 13. While the largest percentage of the increase is in the Rio Grande Valley, it's still an issue in San Diego. 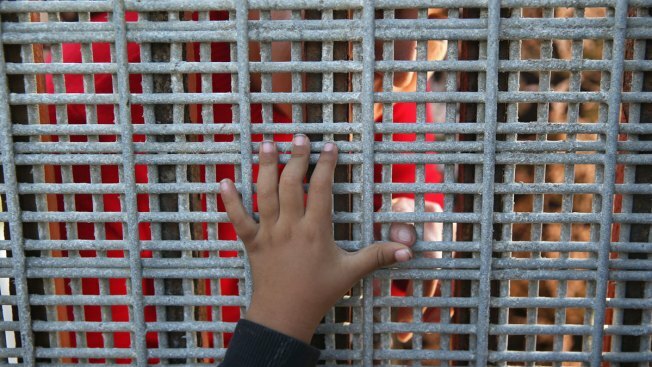 In 2013, over 400 unaccompanied minors were caught crossing our local border crossings. This year, that number jumped to 642, a 55 percent increase. According to Immigration and Customs Enforcement officials, San Diego has 25 beds designated for these children. “Twenty-five beds are insufficient. It’s certainly not enough so they get sent to other locations,” Rios said. In response to a call from action made Monday by President Barack Obama, federal officials announced a Navy facility will be opened by week’s end in Port Hueneme, 60 miles west of Los Angeles to handle the growing number of young migrants. Rios said the children are from as far away as Honduras and El Salvador. “It’s an extremely dangerous journey that each of these young people take to cross into the U.S.,” Rios said. On Monday, President Obama called the surge a crisis. Cecilia Muñoz, the White House Director of Domestic Policy said the government must mobilize to help care for the children who have left their native countries due to economic conditions, violence or a desire to be reunited with family in the U.S.
“It also includes more girls than we've seen in previous years and more children under the age of 13 compared with previous years,” Muñoz said. The president appointed the head of the Federal Emergency Management Agency, Craig Fugate, to lead the government's response and asked Congress for $1.4 billion in extra funding to help house, feed and transport child migrants and has turned to the Defense Department to temporarily house some of them. Detained youngsters are transferred within 72 hours to the Department of Health and Human Services' Office of Refugee Resettlement to be housed in shelters. The 42,000-square-foot facility in Port Hueneme has bed space for 570 people, was remodeled in 2007 and is equipped with showers, bathrooms and recreation spaces for TV watching and games. The government is also housing migrant children at a military base in Texas. Officials then begin searching for relatives or other potential guardians in the U.S. The average stay for a child in a U.S. shelter was 45 days last year. Most are reunited with family to wait for their immigration cases to move forward. Rios said his organization has volunteers who clothe, feed and house the children at rescue.